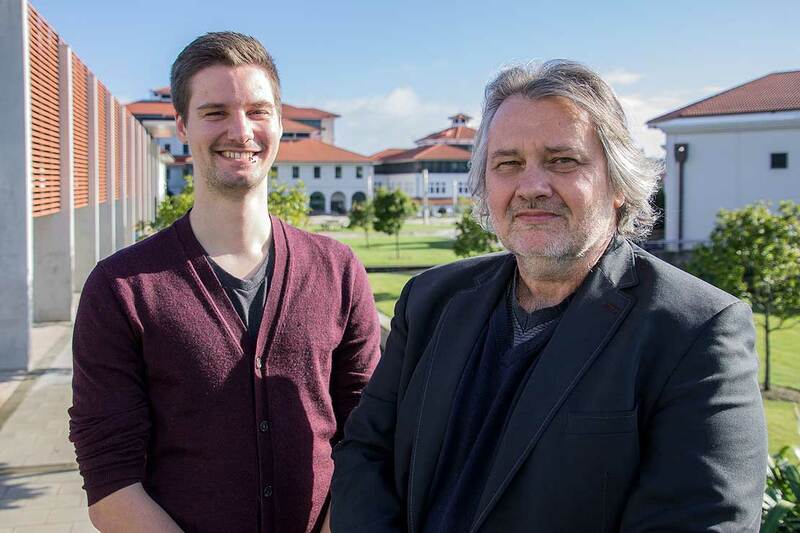 PhD student Lukas Trombach and Distinguished Professor Peter Schwerdtfeger. A world-renowned Massey University researcher in quantum chemistry has opened the doors for a ‘gold rush’ of future research in gold nanostructures. The paper Hollow Gold Cages and Their Topological Relationship to Dual Fullerenes was co-authored by Distinguished Professor Peter Schwerdtfeger, Lukas Trombach, Sergio Rampino and Lai-Sheng Wang. It featured on the cover of the international publication, Chemistry - A European Journal. The excitement is around a new class of golden fullerene structures discovered by Professor Schwerdtfeger the acting head of Institute of the New Zealand Institute for Advanced Study and PhD student Lukas Trombach. Professor Schwerdtfeger explains that gold has sizeable enhancement factors in nanoscience compared to lighter metals like silver and copper and experiences “strong electron donation toward the gold atoms due to its increased electronegativity, which makes them ideal for electronically fine-tuning chemical and physical properties,” he says. Catalysts (a substance that increases the rate of a reaction without being used up itself) are used in chemistry to increase the rates of chemical reactions, and are important in industrial processes to save energy and reduce costs. Since it was discovered that gold nanoclusters are catalytically active (capable of accelerating or causing a chemical change by the addition of a catalyst) the field of nanoscience has experienced renewed activity, and studying their structure has been the ambition of many scientists over the last 20 years. “A catalyst is essentially a chemical shortcut that saves time and energy and catalysts with gold nanostructures could potentially speed up these processes compared to other metals,” Professor Schwerdtfeger says. 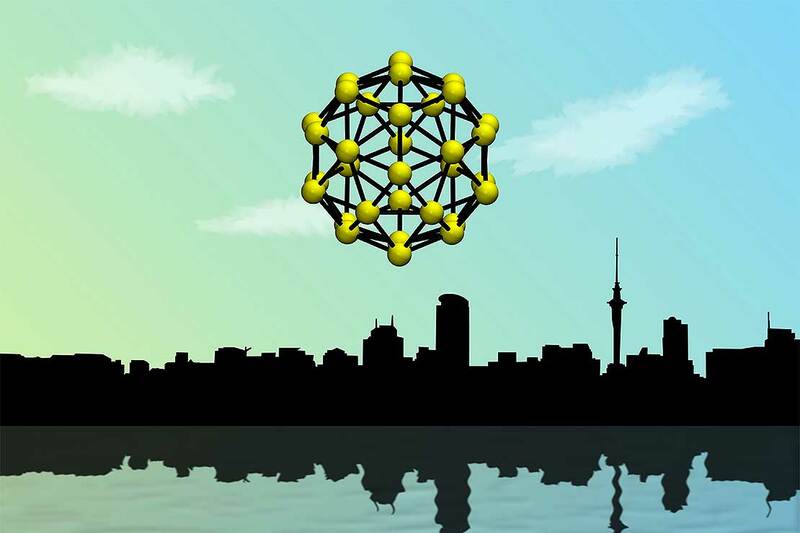 Cover image: the dual golden fullerene Au32 (earlier proposed by Dage Sundholm in Helsinki) above the Auckland skyline. NB: In the full cover image the carbon fullerene C60 can be seen reflected in the water. “In the cover photo, we had Auckland’s skyline in mind as most of the research was carried out at Massey University in Auckland. The reflection of the carbon fullerene in the water demonstrates the unique one-to-one correspondence between it and the golden fullerene,” says Professor Schwerdtfeger. Professor Schwerdtfeger dedicated the paper to Professor Gernot Frenking in recognition of his 70th birthday. Professor Frenking was the one who asked the simple question concerning fullerene structures that led Professor Schwerdtfeger to seek the answer.